Ever the school teacher, Joe Schmidt just couldn't resist helping out when Tadhg Furlong was struggling with the phrase in response to a question at the Irish team announcement in Carton House. Ireland have five trees ahead of them over their next seven weeks, while the wood stretches all the way to Japan in September/October. Of course as fans we want our boys in green to win another Grand Slam and that is all we'll think about until it ether happens or isn't possible, but we always have to be mindful of the lessons learned that can be bought forward. And as if things needed to be made even more interesting, the rugby gods have us hosting Eddie Jones’ England in part one of our defence. Say what you like about their shortcomings in recent seasons - whatever they might lack when they take to the Aviva Stadium pitch they will more than make up for in motivation (not to mention treachery). But arguably Ireland's strongest weapon under Joe Schmidt has been our ability to control our own approach to this wonderful game. Many have tried to either disrupt our systems or impose their own on us but pretty much all have failed, even the best in the business. So when looking ahead to any Ireland fixture for this calendar year, the only place to start is the selection of the 23 green jersey wearers, and this is definitely an exciting looking group. 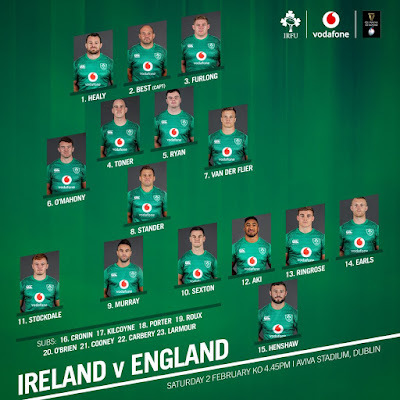 Remember all the doubting opinion back when Joe first began picking Robbie Henshaw and Jared Payne in the centre as his solution to the whole “how do we replace Darce/Drico” dilemma? One of the biggest complaints was from perennial Rob Kearney-bashers who pointed out that not one but two full-backs were being used out of position. Well since then Robbie has made himself virtually undroppable for both province and country at 12, yet after Eddie Jones had said several times in the press that his 2019 Six Nations plan revolved around beating Ireland not anyone else, this move of putting him back at 15 has to have him scratching his head. The attacking implications of this move actually come close to making my head spin. Kearney The Elder is certainly good at joining the line on occasion but it's hard to deny that Robbie's ability to put gainlines behind him is among the best on the planet right now so this position adds a whole new dimension to our arsenal. And what facilitates this move is the form of Bundee Aki. One of the most important aspects of this World Cup cycle for Joe has been the development of credible alternatives should injury befall any position on the park, and in Aki we have definitely seen someone who is not only able to step in and get the job done, but also he is clearly 100% committed to the Irish cause no matter what some might say to the contrary. So while it's not the selection I would have predicted (I assumed Rob K would start with Aki left out and Henshaw at 12) the chances are it could have also been what Eddie was planning for, which makes the changes all the more appealing. The pack is slightly different story - man for man what I expected. I hear some chatter about the ruggersphere that perhaps Sean Cronin should be starting ahead of Best but even with my extra strong blue goggles on I can't support it. Whatever about perceived difference in form, and I'm not too sure it's all that much if there is one, Rory's leadership through a period of great success puts him on the team sheet and that is just that. Elsewhere around the eight we've got proven ball carriers, proven ball poachers, and solid lineout options. Could not have a single complaint about that group of forwards whatsoever. I've written loads of words already heaping praise on this team and I haven't even gotten to our phenomenal wings and halfbacks. Hopefully I'll be able to make up for that by harping on the performances when I'm writing up the match on Monday as all four are potential match winners. Do I need to look too closely at the English team? I really don't think so. Sure, they have many threats of their own, and of all the elements in switching Robbie to fullback that could test us the most, it's in defensive coverage with the likes of Tuilagi, Billy V, and eventually Nathan Hughes running at us. But I'd be more interested in examining their overall approach, which surely has to be to stop us settling into any kind of rhythm in the opening half an hour. Will they go the boring predictable route of clattering Johnny off the ball and pretending it was incidental? Or has Eddie gone for something even more Machiavellian? How about the possibility of them coming up with an actual better game plan? It's almost too much for me to think about, it's such an exciting prospect. Finally there's the Irish bench. Great to see Seanie O'Brien back in the test frame and you can be sure we'll get a quality late shift from him regardless. And I have said many times before how much I believe Dave Kilcoyne belongs in green and our front row will lose absolutely nothing in intensity when our reserve front row is introduced. 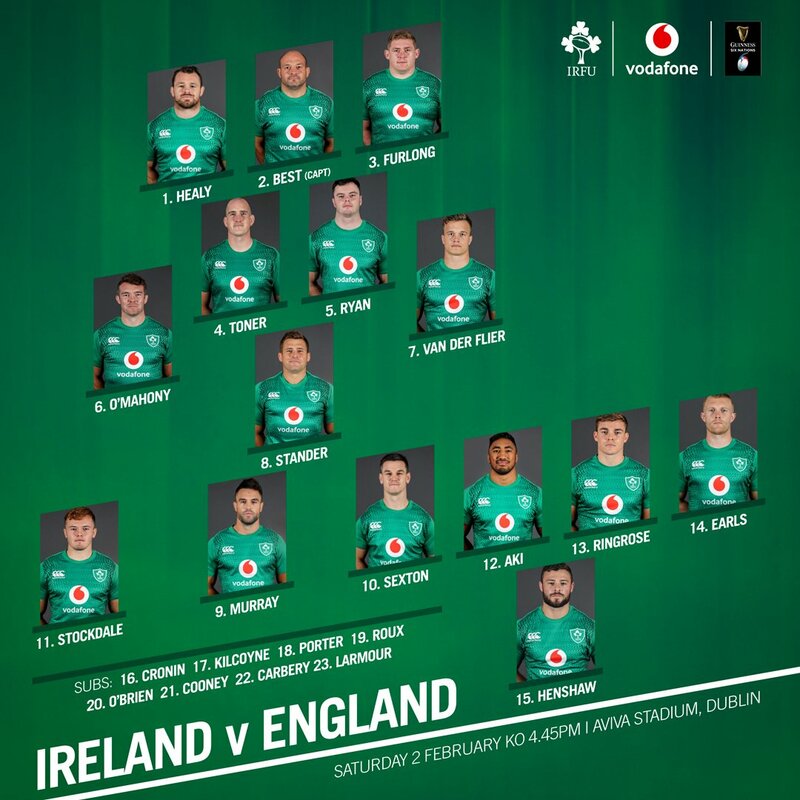 Even Quinn Roux, whom many wouldn't have considered to be anywhere near Ireland standard a few seasons ago, doesn't look out of place on the team sheet. The bookies have us winning by 9 - actually if we maximise our performance levels in accuracy ad particularly discipline, I think we can actually win by more but I'm going to give our guests some benefit of the doubt in being well prepared and suggest it might take us a while to establish a decent winning margin and with a bounce or two of a ball against us, not to mention a controversial decision or three for the officials to grapple with, they may sneak a losing bonus; I'm saying Ireland by 5-7pts. PS Best wishes of course to both the Women's and Under 20s - both might have considerably more difficult tasks against their English counterparts but with home advantage hopefully they can put up a good fight. As I said in Wednesday's Harpin Points, it's a shame they have to compete with the men's tournament for our attention on these big rugby weekends. England: 15 Elliot Daly, 14 Jonny May, 13 Henry Slade, 12 Manu Tuilagi, 11 Jack Nowell, 10 Owen Farrell, 9 Ben Youngs; 1 Mako Vunipola, 2 Jamie George, 3 Kyle Sinckler, 4 Maro Itoje, 5 George Kruis, 6 Mark Wilson, 7 Tom Curry, 8 Billy Vunipola. Live on Virgin Media One.